Known as the “First Lady of Beef Promotion,” Marie knew about cattle and horses from her youth on the family ranch. She brought the first Santa Gertrudis cattle to North Dakota and joined with other ranchers to promote beef sales and distribution. 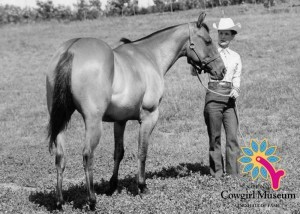 Active in pleasure-riding events, Marie and her husband Jim were also among the first to raise registered quarter horses in North Dakota. Marie served as the first female chair of the National Livestock and Meat Board.